Platinum accredited top Georgia Roofer, Braswell Construction Group, brings Atlanta customers over 16 years’ experience in the industry and is recognized in Georgia as the top roofing specialist for Shake & Slate roofing. Braswell Construction Group (BCG), a leading GA roofer and roofing contractor, is conveniently located in the heart of Buckhead Atlanta. One attribute that separates BCG from other Atlanta roofing contractors is that they are recognized as a DaVinci Masterpiece Contractor by DaVinci Roofscapes and one of very few installers of Brava Roof Tile that is certified. Additionally, BCG holds the exclusive elite status of Owens Corning Platinum Preferred Contractors only given to companies that not only met the highest standard requirements, but also exceeded them in all areas of their trade. Once named as an Owens Corning Platinum Preferred Contractor, the provider is considered among the best in the industry. Call BCG today to get a free estimate and $500 off your next new roof. 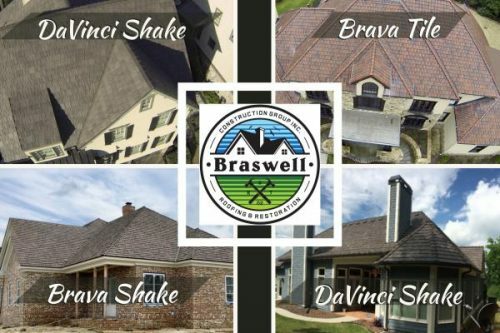 Braswell Construction Group (BCG) has been locally owned and operated since 2002, and prides itself on its high-quality craftsmanship, exceptional customer service, and professional acumen. BCG has a reputation for always completing its roofing and restoration projects on time and on budget while providing customized service, top-notch customer service, and unparalleled workmanship. A full list of services is provided on the company website. Some options cover residential and commercial renovation and restoration, including repair for storm damage, water damage, and fire damage. BCG offers premium shake and slate roofing options for customers wanting to improve the look and function of their home. The expanding category of synthetic roofing products cater to homeowners, builders, and remodelers who prefer renewable resources that come with the advantage of extreme durability and longevity yet want the look of natural slate or shake roofs. Braswell Construction Group explains that synthetic slate roofing is a mixture of recycled rubber and plastic put into molds that are taken from real slate and shake roofing. As contrasted to real slate & shake roofing, this is less costly, lighter, and is much more resilient and durable because it can be installed without the concern of damaging the product. And just like the real slate & shake roofing, its life expectancy can also last a hundred years. Advanced materials and manufacturing technologies give the synthetic products better resistance to weathering, greater durability, and longer lifespans than real slate or cedar, according to manufacturers. “The material is mimicked to obtain efficiency and also longer life over the natural product,” says Chris Braswell. “Other composite roofing materials pale in comparison to DaVinci & Brava. We use DaVinci & Brava products because they perfectly resemble the natural beauty of cedar shake roofs and slate roof shingles, but without the drawbacks and upkeep.” The final appearance of BCG’s installed DaVinci and Brava products is almost impossible to distinguish from the natural material. BCG is also one of the few certified installers of the great choice of Brava Roof Tiles. The company recommends this exceptional product because it is not only maintenance free but authentic in appearance and resistant to the elements making it virtually indestructible even against hail and falling trees. In addition to Braswell Construction Group’s heart of Buckhead Atlanta location, their expert team also has locations in Covington/Conyers, Greensboro/Lake Oconee and has been successfully servicing all respective surrounding areas since 2002. Full details of the options available through BCG and the roofing services provided can be found on the URL above. Interested parties can get in touch by calling (678) 283-2551.